Earlier this week, Jeezy proved Godwin's law also applies to rap music when he dropped "Jizzle," another single from the oft-delayed TM 103. As much as we love Jeezy, he was dead wrong for wanting to go All-Hitler Everything by saying he "should be a Nazi." But as flagrant as that line was, it's not even close to the first time a rapper has mentioned Adolf's crew. That's the thing about rap music: It's the only genre where someone would actually namecheck Nazis. (Oi! music notwithstanding, we guess). Can you imagine Justin Bieber namedropping a regime that's the very face of evil and tyranny? Not until his third album, at least. And it's not just because rappers can be tastelessit's also because sometimes they're lazy. It's just too easy to rhyme "Nazi" with "Paparazzi" or "Versace" or "Fonzie and Potsie." 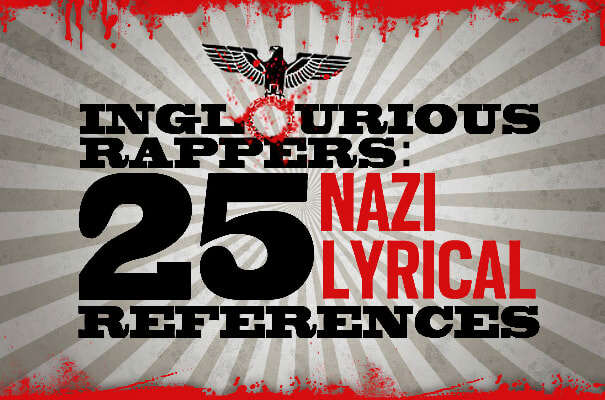 That's why we put together Inglorious Rappers: 25 Nazi Lyrical References: to put a end to lazy writing! Oh, and celebrating genocide too. To put an end to celebrating genocide.